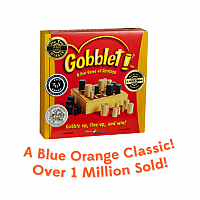 Gobble Up, Line Up 4 Gobblets in a Row and Win! 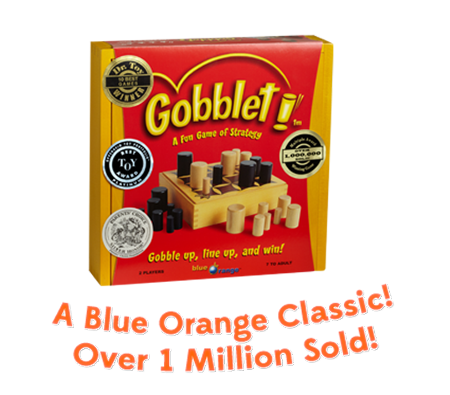 Gobblet is the Multiple Award-Winning, Fun Game of Strategy. As easy as Tic-Tac-Toe, Gobblet can be learned in a few seconds and is fun to play again and again. Beautifully crafted, Gobblet is entirely made of wood and includes a great box with self-storage for all pieces. With irresistible fast moving play and astonishingly simple rules, Gobblet is a fun game for the whole family! Recommended for ages : 7 to 12. Measures approximately: 9.88 x 2.38 x 9.88 inches..